Robot B-9: The Class M-3 Model B9 General Utility Non-Theorizing Environmental Control Robot is the most important piece of equipment on the Jupiter 2 mission. In addition to running air and soil test on the planets they visit, the robot can lift heavy objecs and has numerious defensive features. It can also speak and play the guitar. 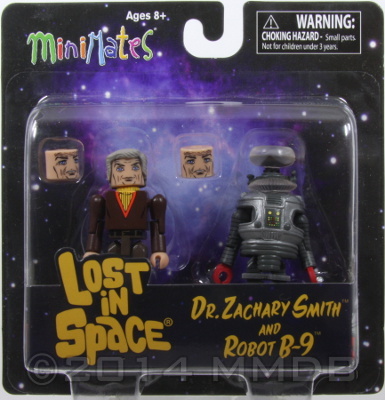 Dr. Zachary Smith: Dr. Zachary Smith is a doctor of psychology and an expert in cybernetics. Unfortunately, he is also an enemy agent, sabotaging the Jupiter 2 and causing it to crash on Priplanus instead of reaching their destination near Alpha Centauri. While not overtly dangerous, his self-serving ways often cause trouble for the Robinson family.